An okay Will Ferrell comedy that has some decent jokes, but a ridiculously simple story. Surprisingly a pretty funny movie, this one is all about ridiculous situations that turn into humorous punchlines. 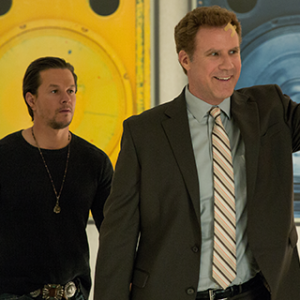 Will Ferrell plays a father who is trying to raise the kids of another man. When that other man, Dusty (Wahlberg,) rolls into town, and tries to win his family back, the craziness begins. There are lots of gimmicks here and most of them turn out to be pretty funny. One has to constantly disregard how ridiculous it is that they are happening to begin with, but once you get passed that, there’s a decent amount to laugh at, even if the plot is pretty formulaic and predictable. Daddys Home is one of those Will Ferrell comedies that is right down the middle in terms of where it ranks with the other movies he has made. It’s nowhere near his best (Old School, Elf,) but it’s also miles above his worst (Semi Pro, Get Hard.) This is a movie with a very simple and basic premise, yet it somehow manages to find a number of opportunities to have fun. Brad (Ferrell,) is a man who has a beautiful wife and is happily settled in to being part of a family with kids who are not his. Before Sara, (the wife, played by Linda Cardelini,) met Brad, she was married to Dusty (Mark Wahlberg.) He’s the guy who fathered her kids. And now Dusty is back in town. And he’s trying to run Brad out. All of this would be a fine premise if Dusty was just staying nearby, and keeping the tabs on the family. But in the case of this movie, Brad pretty much invites the guy over and then invites him to stay over. That’s where the movie gets completely unrealistic and even pretty stupid. It all starts with the kids getting a phone call. It’s Dusty, their father, who they haven’t spoken to in months. Apparently Dusty doesn’t know that Sara got remarried. Sara never told him. Now Brad takes the phone and mentions that he’d like to take Dusty out for a cold one sometime. Dusty jumps at the opportunity, says he’s flying in tomorrow, gives Brad the flight info, and asks to be picked up. The next thing you know, Brad is at the airport looking for Dusty. When Dusty shows up and Brad asks if that’s who he is, Dusty says no, and walks right by him. Brad stays there for a while and when he finally leaves and gets home, he finds that Dusty is indeed the man he spoke to at the airport, and has now been there at the house for a while, spending time alone with his ex-wife and kids. The humorous situations continue. Dusty builds not only a massive treehouse in their backyard, but also a half pipe ramp for skateboarding. Why does Sara never call Dusty out on doing this? Of course, when you get passed that, it leads to a great scene of Brad trying out the half pipe and winding up somewhere that he doesn’t belong. Once again, the situation and setup are stupid, but the punchline kind of makes it all worthwhile. Another situation like that involves a handyman named Griff (Hannibal Burgess) who Dusty befriends and basically gets to come live with the family too. It’s completely idiotic, and yet Burgess is pretty funny, so we give it a pass. This is basically the direction the movie goes until we get the inevitable ending that we have seen in a thousand movies before (it’s the same formula used for romantic comedies and buddy comedies, where the two characters breakup or separate, and then reunite for the ending.) While this movie has loads of ridiculous moments, it also has a surprising number of likeable qualities, including a situation where Dusty is honest with Brad about trying to run him out of town and get his family back. I like that Dusty isn’t really made to be an evil character, like you might expect. The movie isn’t great, but it is definitely better and funnier than one might have thought.